Since the 99-year-old Carnegie library at Greenbrier and Jessamine reopened as the East Side Freedom Library last year, it’s hosted concerts and film screenings, lectures and panel discussions, an economics workshop and a Juneteenth celebration. 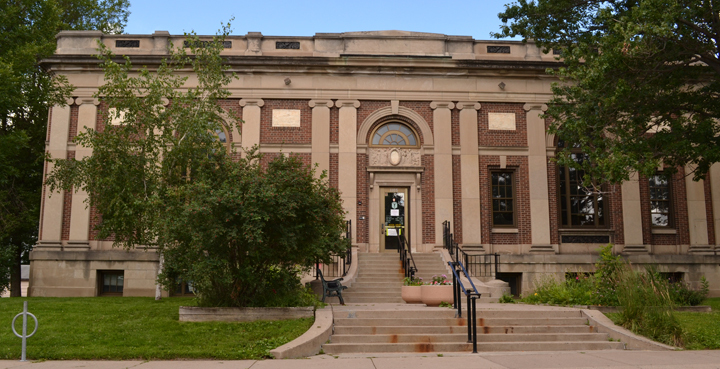 The independent, nonprofit library is becoming the center of grassroots community activity, history and storytelling that East Siders Peter Rachleff and Beth Cleary envisioned after leasing the building from the City of St. Paul in March 2014. So what’s next? In an interview last month, Rachleff highlighted some of the programming, offerings and volunteer opportunities on the horizon that might interest labor activists. Monitor the library’s full calendar of events online, and follow the library on Facebook and Twitter. One of 12 panels from the St. Paul labor history on display in the library. The East Side Freedom Library is the temporary home of a lush, expansive mural celebrating the city’s labor history, “Saint Paul Labor Movement: Flowing Out of Us.” Commissioned by the St. Paul Regional Labor Federation, the mural will be on display at the library as the RLF awaits construction of a new labor center at 345 West 7th Street. Local artists Keith Christensen and Ta Coumba Aiken teamed up to paint the 12-panel mural, unveiled eight years ago in the old Labor Centre’s meeting hall. 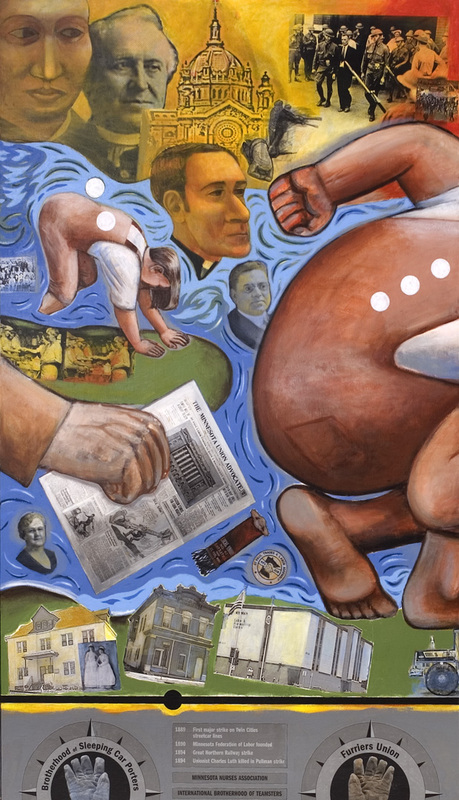 The colorful work blends images depicting the variety of ways unions and their members have contributed to St. Paul’s cultural, political and economic identity. Rachleff said he already has plans to use the mural as a teaching tool, particularly with students working on History Day projects. “I want them looking at the mural and the faces that are in it and thinking about the stories behind the faces,” he said. The mural will serve as a backdrop for a series of arts-related programs at the library, including an adult-education course in telling workers’ stories through art and music, scheduled for this fall. The library also is recruiting Hmong artists from the East Side to paint a mural along the staircase from the main floor to the basement. Rachleff said the project is an opportunity for a “conversation” between murals and artists. With support from the St. Paul RLF and its nonprofit arm, the Labor Studies and Resource Center, the library is forming a Labor Advisory Committee of union officers and activists to help guide programming at the library. Of course, programming requires resources, and the library is also recruiting unions to become “institutional members” of the library, committing to an annual contribution in support of that programming. Other options include sponsoring shelves to hold the library’s growing collection of materials and to help cover its overhead costs. Eighteen volunteers, from college students to retirees, are working this summer to catalog the library’s extensive collection of books and other materials. They’ve processed about 7,000 books – mostly labor-related – so far, with about 10,000 to go. MAPE member Bruce Willms, retired Dean of the Metropolitan State University Library, is coordinating the project and training volunteers. More volunteers, Rachleff said, are needed. To volunteer in support of the cataloging effort, or to learn more about opportunities to support the East Side Freedom Library, email info@eastsidefreedomlibrary.org or click here for a contact form.